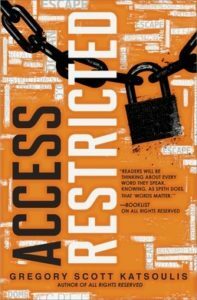 I enjoyed All Rights Reserved last month and sought out Katsoulis’s follow-up Access Restricted only to be disappointed. I began reading this book almost 3 weeks ago when I was in Arkansas for a funeral but I only finished it this weekend when I realized I needed to turn it back into the library on Monday. At the close of the last novel Speth Jime, along with Kel, Henri and Margot, have disrupted the WiFi of their dome in order to give people the ability to communicate (literally) freely. This novel picks up right where we left off and the lawyers of this copy-righted nightmare can’t stand for the world Speth envisions and warn Speth they will turn the WiFi back on and retake the dome. “It was so annoying,” Sera said. I could hear her frustration, even now, and I had to laugh at how she put it. “You think I annoyed them into all this?” I asked, waving a hand around the car like it was the world. The characters of Norflo and Sera, children who, like Speth, grew up under the care of their state appointed guardian Ms Harris when their parents were taken into indentured servitude for outstanding debts from previous generations, are expanded on in this novel. They join Speth, Henri and Margot in a stolen car to the world outside their dome in an attempt to gather intel and possible aid for the WiFi-less Portland. Margot’s sister, Mira, stows away and tries to participate in the dangerous mission these teenagers have undertaken. Kel, who we now know is a lawyer herself, stays behind with Saretha who was badly injured in the uprising. After a devastatingly dull chase scene and a moronic recon mission Speth is captured by Lucretia Rog, then she escapes and then she makes it down to Tejican (Mexico). Things get briefly more interesting south of the border as the reader discovers that the United States are alone in their monetizing of words and gestures. In general the people of Tejican give our ragtag group of heroes a more true state of the world- including that children born to indentured servants become property of the people who own the servants’ debt. The ending is silly and overly simplistic but doesn’t leave much room for a third book so perhaps it is for the best?